Waterbury Clock Co., "Regulator No. 80", C. 1915. Oak case is 41" high. Retains the original finish but has been lightly cleaned of grime. A label on the door says it was, "New November 25, 1910". 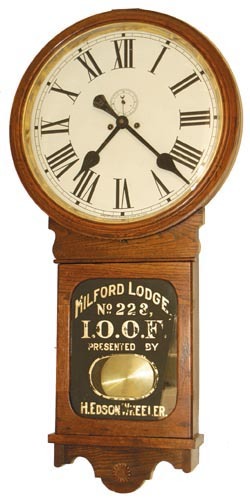 Sold that date by, H.E.Wheeler, a clock dealer in Milford, Mass. Note the good glass in the lower door that is painted, "Milford Lodge No. 223, I.O.O.F. Presented by H. Edsel Wheeler". Good makers label inside the case. Excellent dial, hands, pendulum, beat scale, and even the original key. Movement is 8 day, 2 weight, time only. The original flat weights that descend down the sides of the case are false grained to resemble wood. Ly-Waterbury #577.